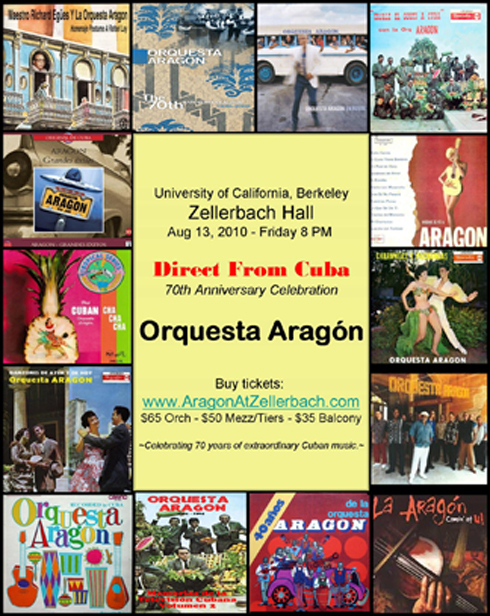 As the cultural door between the U.S. and Cuba opens again, Orquesta Aragón, with over 100 albums recorded and led by Rafael Lay, Jr., accomplished violinist and musical director, returns after many years for their 70th Anniversary Celebration at the University of California, Berkeley, Friday, August 13, 2010 at 8:00 p.m. in Zellerbach Hall. This legendary orchestra, formed in 1939 and continuing today as one of the most popular groups in Cuba and around the world, brings the musical genius of generations of musicians dedicated to sharing their rich musical heritage with both young and old music fans throughout the world. They can be heard now on Radio Progreso in Havana, and have played on that station since 1955. With a creative range from danzon, son, cha-cha-chá, and more, Orquesta Aragón’s classic charanga form with rhythm section augmented by flutes and violins, electrifies audiences with a pulsating and pleasing mix of old favorites and new tunes. If you loved Buena Vista Social Club and continue to enjoy Juan de Marcos and the Afro-Cuban All-Stars, here April 2011 with Cal Performances, you will surely love Orquesta Aragón, La Madre de las Charangas Cubanas – The Mother of The Cuban Charangas. Known for such hits as “El Bodeguero,” “La Gloria Eres Tu,” and “Calculadora,” the group has performed in presitigious venues all around the world – Carnegie Hall in New York, Olympia Theatre in Paris, and Tchaikovsky’s Theatre of Russia. Come celebrate this historic occasion of 70 years of spectacular musical achievement. 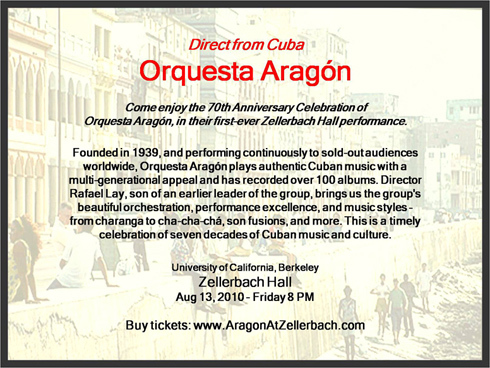 Orquesta Aragón's first tour in many years starts in Miami and comes to the Bay Area for one show only on Friday, August 13, 2010 at 8 p.m. Purchase tickets right away for best selection of seats in Zellerbach Hall.. $65 Orch-$50 Mezz/Tiers-$35 Balcony. Tickets are available now at www.AragonAtZellerbach.com .